Enter For a Chance To Win a Hawaii Getaway! Time to hit the waves! 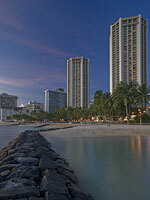 You could win a tropical surf retreat for two at the Hyatt Revency Waikiki Beach Resort and Spa, in Honolulu. The winner and a guest will receive a three-night stay, a two-hour surf lesson provided by the Ty Gurney Surf School, round-trip transfers to the surf-lesson site, two souvenir gifts, and a CD of photos from the lesson. Airfare not included. To enter, visit Health.com/hyatt-regency-waikiki and tell us in 50 words or less why you deserve a getaway. No purchase necessary. Purchasing does not improve your chances of winning. Visit Health.com/hyatt-regency-waikiki-rules for official rules, to learn how to enter, and more. Contest begins June 24, 2011, at 12:01 a.m. (ET), and all entries must be received by 11:59 p.m. (ET) on August 18, 2011. Open to legal residents of the 50 United States and the District of Columbia age 21 or older at the time of entry. Void where prohibited by law. Tell us in 50 words or less why you should win.